Morocco never ceases to surprise me for the speed with which things grow. As the chill of winter fades, little lines of green stripe this hills surrounding Fez like a 70’s knitted sweater; sage green knotty ridges against the chocolate brown earth. Blink and they have grown waist high, first with their subtle white flowers with a black eye, then pods of beans appear. Broad beans were never top of the list of favourite foods. School dinner memories of a tough slightly grey boiled vegetable, served in what could only have been designed as a punishment, can scar you for life. But the broad bean in Morocco is an element transformed into such a spectrum of deliciousness that makes it near impossible to link it to the sorry European counterpart. The quantity of broad beans that are grown here is surprising too, but dried, they become a staple meat replacement in tagines, served with preserved lemons and red olives, or the base of one of the national breakfast dishes, Besaraa: a dried broad bean soup, served with cumin, garlic and olive oil. So the early spring crop needs will be used all year round. Picked when still tender, they are transformed into a cooked salad, one of the famous Moroccan Zaalouk dishes. (Zaalouk literally meaning mashed in Arabic). Pods and all are coarsely broken up and steamed, then mixed with a marinade of olive oil, lemon juice and cumin. Let overnight to infuse, this dish is quite simply heavenly. If the pods are larger, then the beans only are used, sometimes the beans themselves being peeled to reveal a spearmint green treasure that can be served just slightly steamed so still crunchy. 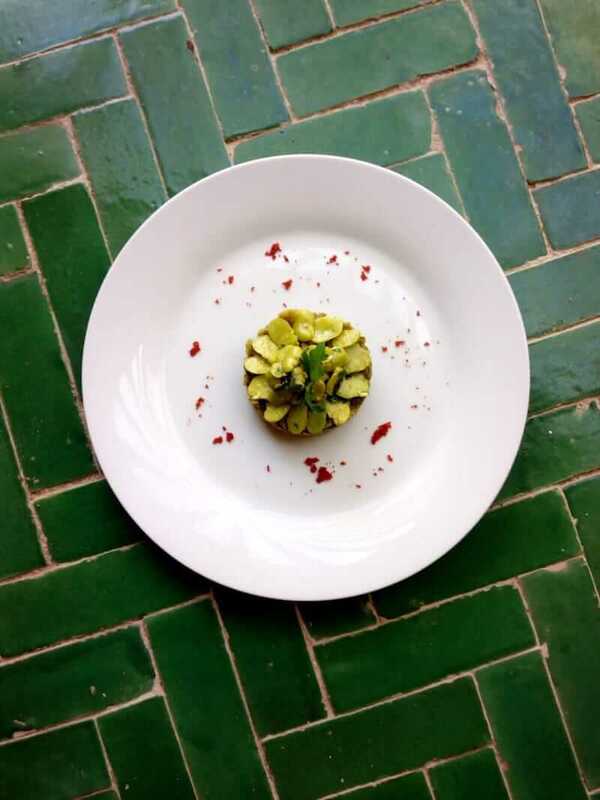 At Eden, the restaurant at Palais Amani, the combination of crushed broad beans with the crunchy green bean salad are on their Market Moroccan menu until the beginning of May. It would be criminal to be in Fez and not stop by to try this combination! New years wishes from all at the Palais Amani!